Languages : Hindi, Garwali, and English. 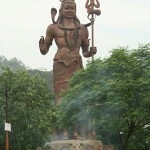 Haridwar is located at the base of the Shivalik hills and 214 km. north east of Delhi. 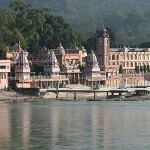 As per Hindu mythology, Haridwar is the “Gateway to the abode of Gods”. It is believed that the Gods have left their footprints in Haridwar, so the place is called “the holiest place in the land”, where the river Ganga coming down from the mighty Himalayas, meet the plains. It is situated at a height of almost 300 mts above sea levels. A memorable Kumbha Mela, which happens once every 12 years, and the Ardh Kumbha Mela, whichcomes once every 6 years, is the main festivals. The place serves as a center for many tourist attraction as well as arts, science, and cultures. It is also center of Ayurveda (Herbal medicine). There are many places of scenic beauty on the outskirts of the town. Air: Nearest airport is Jolly Grant in Dehradun. Rail: Nearest railhead is Haridwar . 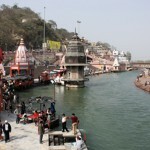 Har-Ki-Pauri: The sacred Ghats is one of the most famous bathing Ghats and was constructed by King Vikramaditya. 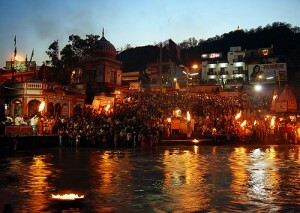 At sunset, the ‘Aarti’ of Ganga being performed. A daily ritual is a thousands of earthen lamps light up at night. Bhimganga Tank: On the way to Rishikesh, this tank is said to have been made by Bhim, with a jab of his knee, when the Pandavas were going to the Himalayas through Haridwar. Canal Centenary Bridge: Located near Har-ki-Pauri, this bridge commands a beautiful view of the canal, and all the Ghats. Parmarth Ashram: About 6 km, on the way to Rishikesh. This Ashram is a housing of beautiful image of Goddess Durga. Manasadevi Temple: Situated on the Vilwa Parvat, it can be reached on foot, by car, or through the ropeway. 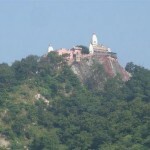 Chandi Devi temple: Chandi Devi temple is located on the top of the Neel Parvat on the other bank of Ganga river. The temple can be reached, after a easy trekking of about 3 km. 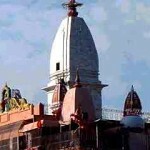 Daksha Mahadev Temple and Sati Kund: The place is one of the five sacred places around Haridwar and located at Kankhal. Legend has it, that Daksh Prajapati, Sati’s father, performed a yagna at this place. He did not invite Lord Shiva. Sati, feeling insulted, consequently, burnt herself in the Yagna Kund, here. 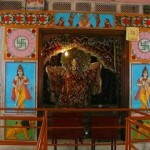 Pawan Dham: The Ashram is famous for its Hanuman temple. The temple is built with pieces of glasses. 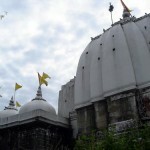 Neel Kanth Mahadev: The temple, situated at a height of 5,500 ft. above sea level, is about 2 km from Laxman Jhoola and east of Rishikesh . It is one of the holiest shrines here. The trek up to the temple, gives a fantastic wide – angled view of the Himalayan peaks, Babhar forests and the plain below. 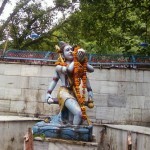 Bharat Mandir: The oldest temple in Rishikesh – the black statue of Vishnu, here, is supposed to have been consecrated by Sri Sankaracharya, in the 9th century. The event is commemorated, during Vasant Panchami, to mark the beginning of spring. This entry was posted in Haridwar, Uttaranchal and tagged about haridwar, Bharat Mandir, Bhimganga Tank, Canal Centenary Bridge, Chandi Devi temple, Daksha Mahadev Temple, dehradun haridwar, Har-Ki-Pauri Ghat, haridwar ganga, haridwar image, haridwar map, haridwar mussoorie, haridwar temple, haridwar temples, haridwar tour, haridwar tours, haridwar trip, Manasadevi Temple, Neel Kanth Mahadev, Parmarth Ashram, Pawan Dham, Sati Kund, tour to haridwar, trip to haridwar, Vilas Vinay Palace. Bookmark the permalink.